HFP’s Rene Teijgeler was interviewed by Wilfried de Jong on the recapture of Palmyra, on March 25 2016, on NPO Radio 1. H4P would like to welcome new volunteer Krystal Osborn to the newsletter team. We offer a huge thanks to her for all her help! 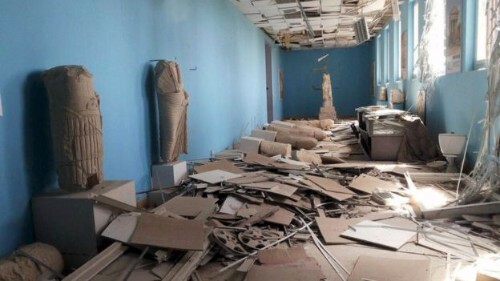 Damage to Palmyra Museum. Copyright BBC. The Archaeology in Syria network offers updates on the battle for Palmyra and images from the site. For the video see here. On 25 March Russian drone footage of Palmyra was released. See the footage (in Russian) here. The DGAM has posted an update about Palmyra on March 25 2016, including the Russian drone footage aired on Sputnik news. See more news about the drone footage here in The Telegraph. ASOR’s Cultural Heritage Initiative will provide an assessment of the various drone footage in its upcoming Weekly Report 85-6. For now ASOR has posted stills to its Facebook page with brief comments. News reports (which we shared previously) suggest that the ancient ruins have been mined and booby-trapped by Daesh. According to RT.com, Russia has offered technical help to make the area safe. Pictures of damage at Palmyra are emerging following the recapture of the city by Syrian troops. See reports by the DGAM here and here. Pictures are also available from BBC, RT.com and The Guardian. Photos of damage to the citadel by Sham FM were collated by Coordinating the revolution in the city of Palmyra here. The DGAM have released pictures specifically of the damage to Palmyra Museum, available here. Pictures are also available here from the Association for the Protection of Syrian Archaeology. This RT Arabic (Russian press agency) video (in Russian) shows damage inside the museum, available here. According to the Daily Mail early assessments suggests Palmyra ruins “are in good shape.” Read the article here. The On 20 March, Aleppo Archaeology released pictures of damage to Al-Addlya Mosque in Aleppo, available here. The DGAM reports on March 15 2016 the state of the site of Tell Ajaja. For more information see here. On March 24 Cosmos examines the effect of the Syrian civil war on agriculture and the landscape of Syria. For further details see here. On March 22 2016 The National examines the ransacking of the personal library of novelist Abdul Rahman Munif in Damascus and the exhibit put together to examine its significance. “The books represented an entire era of Arab intellectual history”, and the library contained “valuable and rare books from the early 50s released by publishing houses from Baghdad, Beirut, Damascus, Morocco and Sudan that no longer exist.” For the full article see here. Alright, not new – we missed it coming out, but still quite possibly of interest. ‘Looting marks’ in space-borne SAR imagery: Measuring rates of archaeological looting in Apamea (Syria) with TerraSAR-X Staring Spotlight‘. Although the body of the text is very technical, in the conclusions the authors are able to show the changes over time in looting at Apamea looking at very recent imagery. They include estimations of not only the total area looted, but which holes have been redug between October 2014 – December 2014; December 2014 – Feb 2015; Feb 2015 – April 2015 and April 2015 – June 2015, thus calculating the actual amount of looting ongoing at any one time. In the context of Palmyra’s recapture, the DGAM offers a tribute to Khaled Asaad on March 27 2016. Read it here. The DG of the DGAM has vowed to rebuild and restore Palmyra. “We are determined to bring Palmyra back to life”, said Maamoun Abdulkarim. Full story at The Daily Star. BBC World Service’s Outlook program on 17 March 2016 reports on Syrian efforts to put together a public community library in Damascus. Further information from the BBC here. The DG of UNESCO, Irina Bokova, has talked with the DG of the DGAM, Maamoun Abdulkarim, about the recapture of Palmyra. UNESCO is calling for a meeting to discuss international contributions to support restoration efforts at Palmyra. More information here. The director of Russia’s famous Hermitage says that his museum and others are preparing for the possibility of reconstructing damaged parts of Palmyra. The full story here. More details are emerging about the so-called “Unite for Heritage Task Force”, a collaboration between UNESCO and the Italian government, designed to protect heritage in times of conflict. The full article can be found here. The efforts of ICONEM and the DGAM to undertake detailed 3D mapping of heritage sites is again considered, here by Daily News Egypt. See also the report from Hyperallergic on March 21 2016 here. Probably this weeks ‘must read‘ article – the ARCA blog examines the legal context of damage to the Palmyra citadel on March 27 2016. A number of news reports highlight the fact that all six of Syria’s UNESCO World Heritage Sites have suffered some damage in the conflict, even though some reporting erroneously claims “total destruction.” More details from the Daily Mail, RT.com and CBC. SAFE published a high-resolution infographic representing a good tally of the destruction that can be accessed here. More on the Million Image Database, a database of 3D images, run in part by the Institute for Digital Archaeology, in this article. It is being developed by volunteers with 3D cameras gathering images of threatened sites in North Africa and the Middle East. The Christian Times has more details here. The NYT looks at the history of Palmyra. Boris Johnson writes on the recapture of Palmyra in The Telegraph on March 27 2016. On March 24 2016 the New York Times looks at the shifting fortunes of the museums of the Middle East. On 12 March 2016 AlJazeera looks at looting in the Middle East. Telesurtv.net looks at some damaged sites in Syria before the war and after.